To Virgil, Dante’s fault is nothing small. He is not merely guilty of some little weakness but of the impiety of questioning God’s justice. 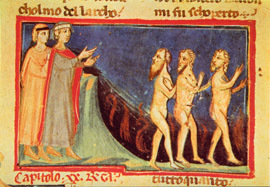 Virgil does not say how Dante should respond to the sufferings of the damned. Should he rejoice at their sufferings or simply look on with indifference? Yet, it seems, for Virgil, pity has no place in Hell. This is not the only place in the Inferno where Dante feels pity for the damned, nor where Virgil at least seems to countenance a more rigorous response. Yet, no where else does Virgil rebuke Dante for his pity; indeed, elsewhere in Hell, the Master not only commends attitudes consonant with pity but himself seemingly acts out of pity for the suffering souls. That we may profit from Dante’s verse, it behoves us to seek a resolution to the dilemma — whether Dante’s responses of pity toward those suffering justly by God’s will were always or never proper. Or, perhaps they were proper sometimes but, other times, not? The queston of pity here, however, resolves itself into a larger question. One may feel other emotions that seemingly suggest a desire contrary to God’s will — sorrow, for instance, when a loved one dies or fear in the face of certain suffering, or a longing to escape it. Thus, we are led to ask a broader question — do we show impiety when, in the face of God’s certain providence, we feel anything else but joy, or, at least, indifference?